Apple's bug bounty program has been available to select security researchers for almost a year now, but according to a new report from Motherboard, most researchers prefer not to share bugs with Apple due to low payouts. More money can be obtained from third-party sources for bugs in Apple software. "People can get more cash if they sell their bugs to others," said Nikias Bassen, a security researcher for the company Zimperium, and who joined Apple's program last year. "If you're just doing it for the money, you're not going to give [bugs] to Apple directly." Motherboard spoke to several members of Apple's bug bounty program with the condition of anonymity. Every single one said they had yet to report a bug to Apple and did not know anyone who had. iOS bugs are "too valuable to report to Apple," according to Patrick Wardle, a Synack researcher and former NSA hacker who was invited to the bug bounty program last year. Apple first introduced its bug bounty program in August of 2016 at the Black Hat Conference, an annual global InfoSec event. 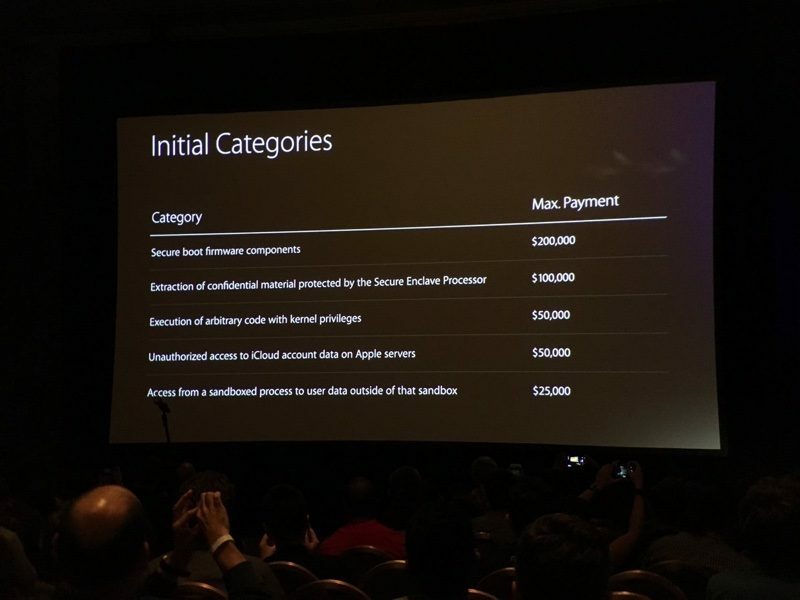 Apple offers bounties of up to $200,000 depending on the vulnerability. Secure boot firmware components earn $200,000 at the high end, while smaller vulnerabilities, like access from a sandboxed process to user data outside of the sandbox, will earn $25,000. Seems a fair amount. How much are they supposed to pay a bunch of guys in their jammies in their parents basement with one hand in their pants? For one, you might've been right if we were talking about security research from 20 years ago, when it wasn't taken so seriously. However, modern security research is a business in and of itself. It takes a lot of knowledge and training, but more importantly it takes resources. Most external security researchers will not have access to the source code of these applications or OS features that they are probing for vulnerabilities. Most groups that actively search for vulnerabilities apply techniques like 'fuzzing' where they dedicate hardware to constantly throw input at an application or API until it breaks, and then the researcher figures out if that break is exploitable. These breaks appear in the forms of application crashes and kernel panics. Most kernel level vulnerabilities would sweep the top of the bounty range, since that would allow for access to a system beyond that of an administrator or super user. Getting back to the point, Apple Hardware does not exactly come cheap, and to compete with a lot of the top end researchers like Google's Project Zero, you're going to need a significant investment to even get started. When any company considers how much to pay out, the company must analyze how frequently bugs are going to be discovered that are significant enough to be rewarded, how much a vulnerability in this particular application or device would be paid for to malicious actors, and what damage to the company would a complete outbreak of an exploit targeting your product would cause to the company's image. If vulnerabilities are going to be frequent, its best to not offer a bounty and to have a team work in-house to discover them - because you will be flooded by submissions from amateur researchers grabbing low-hanging fruit. If vulnerabilities are going to rare and deal high damage to the company's image, as is in Apple's case which champions their security, then the payout needs to be significant enough to compensate researchers for their investment of both time and resources. I hope this clears things up for readers. The prices don't seem bad, and in fact seem pretty generous. I googled some other tech companies payouts and they are no where near Apple's. Facebook claimed their largest payout ever was just $33,500. A bug that was reported that could unlock any user's account received just $15,000. Microsoft's top payout is $30,000 with Google (apps such as gmail or YouTube specifically, not Android) just slightly up from there at $31,337. Unrestricted file system access that can lead to a google account takeover receives a max of $13,337 from Google. For the Android part of Google, the top amount is $150-200k which is more on par with Apple. I think the underground market will always pay more no matter what price Apple sets. It isn’t about being a bad guy its about being compensated for your work. How much is your time worth? Would you sell it short just because it is the ‘proper’ channel? Most wouldn’t. If you're going to be honest here, the choice is selling it to Apple or selling it to criminals, for use in criminal activities. So the guys most likely to cash in these bounties think the bounties should be higher? Everyone misses the most important point. For instance, look at what the $100,000 offer is for. Apparently Apple is not confident enough in the ability of the Secure Enclave to protect information, to boldly offer ten million dollars or even a lousy million to anyone who finds otherwise. The relatively low amount they offer speaks volumes about their claims of unbreakable security. Think about it. Being able to break the Secure Enclave would be worth many millions to criminals and governments alike. If someone did find a way to say, access the file crypto keys, or change the TouchID stored templates, or get the key to talk to the payment processor.... then what the heck is Apple thinking offering so little, for something that could totally collapse consumer confidence in them ???? Talk about penny wise and pound foolish. Clearly you don't know what a security research firm is. There are lots of companies these days that make all their profit by simply getting their employees to find bugs and report them to a company that pays up Facebook, Google, Apple, etc. It can sometimes take several months to find out how to reproduce a bug. So $200,000 for the worst kinds of bugs, honestly may not be enough for a company trying to pay salaries. And look at what the other side of the coin is: someone finds a bug in the system, sells it to someone else, it causes havoc, and Apple loses Millions in stock losses.